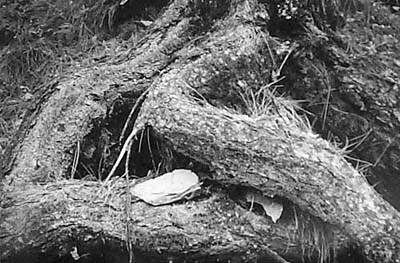 Images of Brett and Edward Weston undoubtedly danced through my mind as I found and photographed these roots, though most of my attention focused on not stepping on rattlesnakes on this late-fall trek. Some fall color still existed on this section of the creek, west of Ruby. (I often visit the once-huge silver boom town because my grandmother on my father's side was born there. And, yes, her name was Ruby, a name that continues to be used in the family.) I parked the pickup and started walking along a well-worn path adjacent to the creek. I quickly created a nice image of the creek and fall colors. Then I used my leg muscles hiking up the hillside across the creek in hopes of finding an old silver mine site or, better yet, a view down the valley. My legs and determination gave out at the same time, far short of a view or mine. Once back at the creek, I continued looking for more fall images. I'd been standing near these roots for a few minutes looking in the other direction at the slow-rolling creek. There's an old photographer saying I often use in such instances: "If you find a great view in one direction, turn 180 degrees and you probably will find another great image." That's what I did this time, and lo, there were the roots right next to my elbow. I spent about a half hour photographing the spot. As I was packing up, a slight movement caught my eye just a bit higher on the hillside, about neck level. Ho, a rattlesnake was stretched all the way out on the cold rocks, his tongue checking me out as well as his eyes. Then I noticed a hole in the hillside. I'd walked all that way to find a mine and here was one right next to me. I just had not seen it, since my eyes and mind only sought to capture the roots on film. A small rock tossed into the crevasse confirmed my worse suspicions, the hole was now occupied by a den of snakes. My once tired legs suddenly found new life. I beat a hasty retreat to my pickup, leaving a hissing echo behind me. The negative laid around for so long because, for some reason, I forgot what drew me to the roots. I also kept busy printing landscapes for sale. A change in seeing occurred in the fall of 1999, with my wanting to explore abstraction. I went back through my images and saw these roots as I had that day several years earlier. This image probably means more to me than it will to others. This is one of those photographs that people say they love but then buy a nice landscape because it goes better with the sofa. Copyright © 2000 by Al Camp. All Rights Reserved.